This is the home page for Peter E. Midford. I am currently working on the Phenoscape project as a guest of NESCent. My doctoral work included a study of social learning and tradition in free-living Florida scrub-jays (Aphelocoma coerulescens), under the supervision of Jack Hailman. 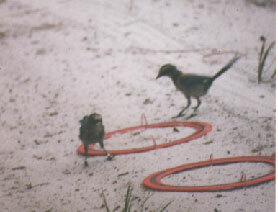 The tradition involved jays digging in the center of a plastic ring for buried food. A paper describing this project may be found here. I also contributed to the PDAP comparative methods package of Ted Garland while working on my degree. I spent a year in Bochum, Germany looking at courtship behavior in pigeons as part of a project to design a virtual pigeon for playback experiments. During the period, I also performed some experiments in human perception of biological motion stimuli. While a postdoc in Arizona in 2001-2002, I constructed a series of "ethogram ontologies." The first was a conversion of a published ethogram (Hailman and Elowson 1992) of into a Protege-based ontology.based on published ethograms as well as raw behavioral data. The published ethogram was of loggerhead sea turtle nesting. I have also released several ontologies for courtship sequences in species of Habronattus jumping spiders. These older ontologies maybe reviewed and downloaded from here. Current Projects Phylontal: a phylogenetically aware ontology aligner (matcher). The first is a continuation of my ongoing work with comparative methods, focusing on Mesquite: correlations in continuous (PDAP) and discrete traits (Correl) and diversification (Bisse/Diverse). I have also contributed to the development of the Nexml format for phylogenetic data. Nexml is an xml-based proposed replacement to the nearly ubiquitous Nexus format. During Summer 2009, I am mentoring a Google summer of code project that uses Nexml as its file exchange format. I am also an ontology curator for the Phenoscape project. My phenoscape responsibilities include maintaining the Teleost Taxonomy Ontology, a vocabulary of museum collections of fish, and troubleshooting support of the Teleost Anatomy Ontology. Finally, I am developing OWL-based tools to support collection and comparative analysis of behavior data. 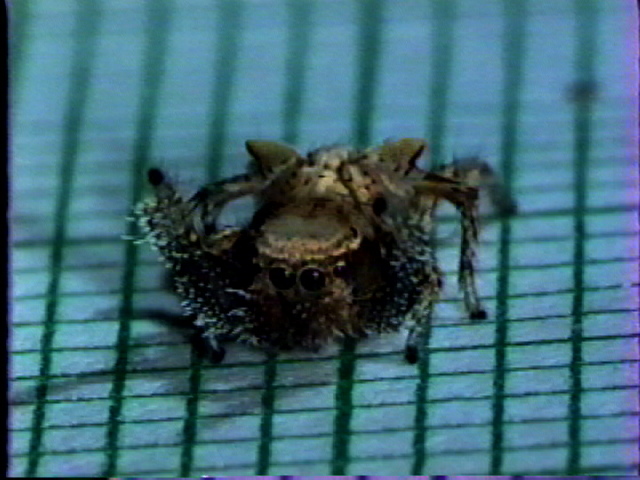 I will be using Habronattus video clips to validate and demonstrate the method(s). I blog occasionally here, and less often here and here. A web-readable copy of my CV is here. 1. Hailman, J. P. & Elowson, A. M. 1992. Ethogram of the nesting female loggerhead (Caretta caretta). Herpetologica 48:1-30. 2. Maddison, W. P., Midford, P. E. & Otto, S. P. 2007. Estimating a binary character's effect on speciation and extinction.. Systematic Biology 56:701-710.